John Henry Reynolds was born in Rugby in 1882 and baptised at St Matthews Church on 1st August the same year. His parents were William Albion Reynolds and Sarah Jane (nee French). In 1891 John Henry was age 8 and living with parents and 3 siblings, at 3 Orton Court off Dunchurch Road Rugby. His father William age 35 was a labourer with the Board of Health. By 1901 the family was living at 26 West Leys, but John Henry was not with them. We have not been able to find his location. On 8th February 1903 John Henry Reynolds, labourer, age 20 married Ann Norman, age 22 at St. Matthews Church, Rugby, and in 1911 he was a labourer with a coal merchants, living at 9 Little Elborow Street, Rugby with his wife Ann and son John, aged 3. A second son was born in 1912 but died the following year. On 8th December 1915 enlisted in the Royal Warwickshire Regiment Reserve (number 19747). He was mobilised on 10th June 1916 and landed in France on 10th Oct 1916 with the 1st Bn R.W.R. A week later he joined the 2nd/7th Bn and was given the number 20309. He was 5ft 5½in tall, and aged 33yrs 4mths. On 1st Mar 1917 he was allocated a new (and final) number 268059. During 1917 he would have taken part in the Operations on the Ancre, The German Retreat to the Hindenburg Line, The Battle of Langemarck and The German counter attacks. The anticipated attack by the Germans, Operation Michael was launched on 21 March 1918, against the British Fifth Army and the right wing of the British Third Army. The German artillery targeted command and communications; then, the destruction of artillery; and then the front-line infantry. The artillery bombardment began at 4.40am on 21 March 1918, and hit targets over an area of 150 square miles, the biggest barrage of the entire war. Over 1,100,000 shells were fired in five hours. The remnants of the exhausted Battalion – and the 61st Division – were transferred from the XVIII Corps on 10 April 1918. Lt. General Ivor Maxey wrote a message of congratulations to the 61st Division, which had ‘… established for itself a high reputation for its fighting qualities and its gallant spirit …’. The Battalion was moved north to a quieter part of the line near Bethune. On 10 March 1918 the Battalion went to St Roche via Amiens, and then entrained for Berguette which was further north and where they arrived at 10.30pm. They became involved in the Battle of Estaires, and then on 11 March, they took up positions to the rear of the Robecq-Calonne Road, and were involved in the Battle of Hazebrouck (12–15 April), when their positions south of Merville were captured. On 12 March the enemy were active and by 10.30am all that remained of the 2nd/6th RWR were withdrawn though the line to a support line. On 13 April, the British artillery was more effective and the line was being held, with troops back in the old line and reoccupying houses. That night they were relieved by the 2nd/6th RWR and returned to Hamet Billet for breakfast. He was evacuated from the front line and by 30th April he had returned to England. He was sent to Mill Road Hospital, Liverpool, by which time he was also suffering from Gastritis. He died there at 12.45 am on 8th May 1918. 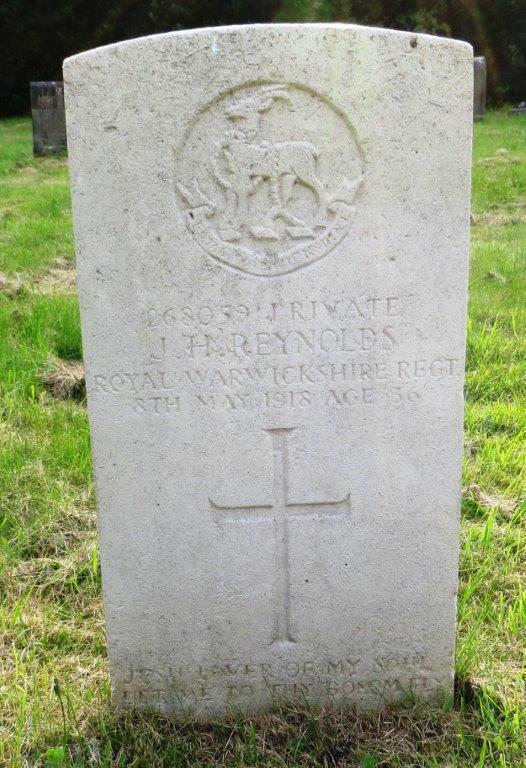 John Henry Reynolds was awarded the British Way and Victory medals and his widow was awarded a pension of 20/5 per week. This entry was posted in Biography and tagged 1918, Operation Michael, Reynolds, Royal Warwickshire Regiment by Christine. Bookmark the permalink.